Thormoor's Watch is the white and hilly area on the feet of Hvitkald Peak and the mountains at the southern end of the range. At the very most northwestern tip of Solstheim, is the Mortrag Glacier. East of this is Castle Karstaag, the ancient dwelling of the frost giant Karstaag. The castle (under a different name) may have been a stronghold of the long gone race of Snow Elves. South of the castle is the rock formation of Hrothmund's Bane, the final resting place of one of Thirsk's, if not Solstheim's, greatest heroes. However, it is not the wonder of the halls of Castle Karstaag or the sheer size of Hvitkald Peak that makes the Moesring Mountains region famous and revered by the inhabitants of Solstheim. 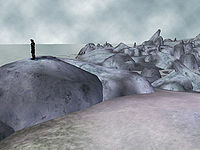 The white plains of the region were also the site of the final epic battle between Falmer and Nords, after which the Nords cemented their place on the island. The mountains are home only to the hardiest of creatures: tusked bristleback, rieklings, horkers, and wolves, among others. Almost nothing else survives in the frozen tundras of Solstheim apart from the animated spirits of the dead. Although few and far between, some men and mer, notably smugglers and mercenaries, also manage to dwell here. This page was last modified on 21 October 2018, at 07:49.